The ever-growing ‘Mobile First’ mantra has led to more people working remotely as enterprise embraces the use of Smartphones and tablets in their organizations. Mobile devices and mobile apps have brought about a digital transformation. Mobility is helping enterprises to connect and collaborate with other office employees irrespective of the geographical location and time. Most importantly it improves efficiency and increases employee productivity. What are the challenges with increasing mobility? How do you ensure your employees are using their devices for work purposes only and not for personal use? How do you ensure a boost in productivity of the employees by minimizing distractions on the devices? How can you restrict employees from downloading questionable third-party applications on their work devices? Are your devices secure? What do you do if a device is lost or stolen? How can you keep track of your devices and employees in real-time? How can you distribute company-related critical information among the employees? IT professionals are concerned about the workplace impact of mobile devices and, therefore, they are searching the market for software solutions which can lessen their worries by helping them manage and control all of their mobile devices. Generally, companies create a formal device policy that educates staff on security risks and best practices. A consensus isn’t enough to protect your company’s devices and data as it voyages between a number of devices across geographies. There are various factors to be considered for proper security and management of enterprise data and the devices. For that, you’ll need a Mobile Device Management (MDM) solution. 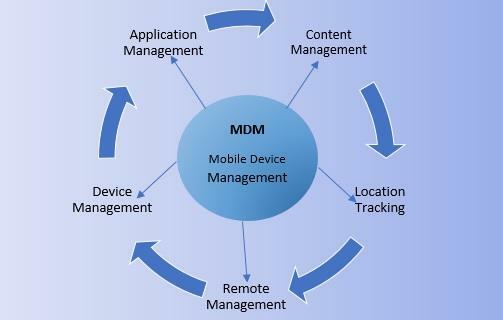 MDM software gives IT managers/admin a central control of devices over the cloud, including data, location and security, applications, Web activity on the devices and content and data transmission. It lets staff enjoy the versatility and efficiency of mobile devices without putting corporate or client data at risk. Device security – Protect devices from unauthorized access by enforcing lock passcodes. Immediate notification is sent and photo clicking happens in the cases of SIM swap followed by a forceful exit from the MDM App. This helps in recovering stolen devices and their business data. There is a built-in messaging platform so that users can send secure messages and have seamless communication with their managers. Remote management – Enroll devices in bulk that can then be segregated into different groups. Whitelist business-related websites on registered devices and allow only necessary apps. This helps in reducing the time that employees waste in unnecessary surfing and controlling the data usage of the devices, increasing productivity. Application Management – All business and work-related applications developed in-house by your organization and/or are not found in the Play store can be uploaded in the Enterprise Store which is a common platform. For an example, an inventory management app. From the Enterprise Store, apps can be further published on registered devices remotely from the dashboard. Content Management – Ensure business-related content is not circulated outside the enterprise network. MDM solutions provide mobile content management (MCM) by which all the necessary documents can be uploaded on the single dashboard and from there published further to the registered devices. In this way, all the employees receive uniform, approved and updated documents across the organization. Content management also ensures the security of the content. Location Tracking and Geo-Fencing – Each device registered on the MDM solution can be set with a Geo-Fence with its location available to be tracked in real-time. It gives an immediate message whenever the device enters and leaves the set geo-fence. Reporting – Finally, MDM reporting tools give you real-time visibility into your organization’s mobile environment, including device status, device usage information and device location details. This helps in getting various insights and planning accordingly. There are some important things to consider when you’re shopping for MDM software. First, platform compatibility. Some solutions are built to support a specific operating system (Android, iOS, Windows Phone, BlackBerry). Next, you should evaluate how MDM fits into your larger IT infrastructure. If you’re a SME, you may not have any kind of centralized IT, which means you can probably consider a simple solution: Something affordable and low maintenance. Hence, you need not invest in heavy IT infrastructure, meaning only minimal IT expertise is required. It is best to understand your business requirements before deciding on a particular MDM solution to best fits your requirements.